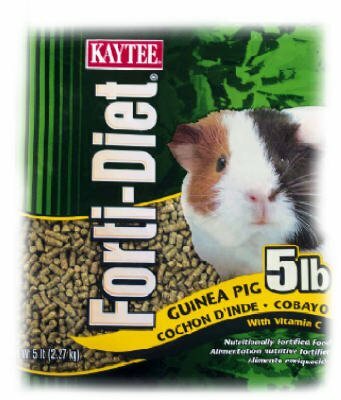 Kaytee Forti-Diet Pro Health Guinea Pig food was developed by an animal nutritional expert to ensure you pet gets the proper nutrition. Forti Diet Pro Health contains probiotics and prebiotics to support digestive health. This food is rich in natural antioxidants for general health and immune support plus contains some larger, more crunchy pieces to support dental health through natural chewing activity. Kaytee understands that sharing your life with a small pet is not only enjoyable but very enriching. Kaytee shows our love by ensuring we provide your small pet with the best nutrition for a long and healthy life. With over 150 years of nutritional experience, it's no wonder why Kaytee is at the heart of every healthy feeding routine. Kaytee Foods is a Nutritionally Enhanced Daily Diet that provides the essential nutrients your pet needs for a long, healthy life. With DHA OMEGA-3 - Supports Heart, Brain & Visual Functions. Rich in Natural Antioxidants - For general health and immune support. Probiotics & Prebiotics -Natural ingredients that aid in digestive health. Naturally Preserved - For ideal freshness. Rich in fiber - Essential for proper function of the gastrointestinal tract. Yucca – For odor control. Promotes a soft, healthy coat. 100502985 Size: 4.75 Ounce, Food Type: Rabbit, Guinea Pig and Chinchilla Features: -Availabe in 4.5 Ounce and 4.75 Ounce. -Sure to please any hamster or gerbil and promote his good health. -Crunchy nuggets loaded with wholesome, delicious treats animals crave and the essential nutrients they need. -Wholesome ingredients like honey, apple, papaya and carrot and unique seeds combine with essential nutrients. Product Type: -Treats. Small Animal Type: -Hamster. Pet Category: -Small Animals. Color: -Blues & Purples. Color: -Browns. Generic Dimensions: -4.75 oz. Weight: 0.30 oz.. -4.75 oz. 6.5" H x 6" W x 2" D. -4.5 oz. Weight: 0.28 oz.. -4.5 oz. 6.5" H x 6" W x 2" D. Dimensions: Overall Height - Top to Bottom: -6.5 Inches. Overall Width - Side to Side: -6 Inches. Overall Depth - Front to Back: -2 Inches. 100502082 Pet Type: Guinea Pig, Size: 5 Pound Features: -Availabe in Chinchilla, Chinchilla Honey Sticks, Guinea Pig, Ham / Gerb Honey Stick and Hamster / Gerbil. -Availabe in 3 Pound, 25 Pound, 4 Ounce, 5 Pound, 10 Pound and 8 Ounce sizes. -Allergen information: manufactured in a facility that processes peanuts and other tree nuts. -Protection - rich in natural antioxidants for immune support and general health. Product Type: -Food. Small Animal Type: -Chinchilla/Guinea Pig/Hamster. Pet Category: -Small Animals. Color: -Blues & Purples. Generic Dimensions: -Chinchilla / 3 lbs Weight: 3.05 lbs. -Chinchilla / 3 lbs 9" H x 7" W x 4" D. -Chinchilla / 25 lbs Weight: 25.6 lbs. -Chinchilla / 25 lbs .5" H x 14.5" W x 25" D. Dimensions: Overall Height - Top to Bottom: -9 Inches. Overall Width - Side to Side: -8.75 Inches. Overall Depth - Front to Back: -4.75 Inches. 100502087 Size: 25 Pound, Pet Type: Guinea Pig Features: -Availabe in Chinchilla, Chinchilla Honey Sticks, Guinea Pig, Ham / Gerb Honey Stick and Hamster / Gerbil. -Availabe in 3 Pound, 25 Pound, 4 Ounce, 5 Pound, 10 Pound and 8 Ounce sizes. -Allergen information: manufactured in a facility that processes peanuts and other tree nuts. -Protection - rich in natural antioxidants for immune support and general health. Product Type: -Food. Small Animal Type: -Chinchilla/Guinea Pig/Hamster. Pet Category: -Small Animals. Color: -Blues & Purples. Generic Dimensions: -Chinchilla / 3 lbs Weight: 3.05 lbs. -Chinchilla / 3 lbs 9" H x 7" W x 4" D. -Chinchilla / 25 lbs Weight: 25.6 lbs. -Chinchilla / 25 lbs .5" H x 14.5" W x 25" D. Dimensions: Overall Height - Top to Bottom: -9 Inches. Overall Width - Side to Side: -8.75 Inches. Overall Depth - Front to Back: -4.75 Inches. Product Form: Pellets. Animal Type: Guinea Pigs. Container Size: 5 lb. Sold as 4 UNITS at $7.35 per unit. (1 unit = each.) 5 lb. Resealable zipper bag helps preserve freshness. Bagged . Manufacturer number: 100032212. SKU #: 8008195. Country of origin: (TBA). 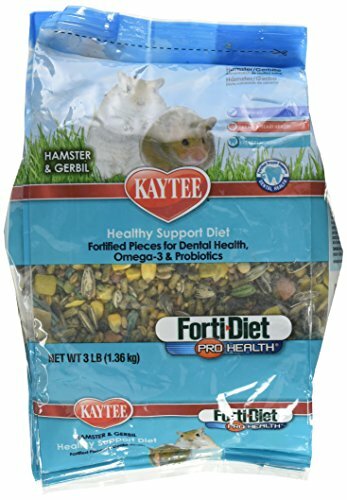 Distributed by Kaytee Products, Inc.
100502072 Size: 3 Pound, Pet Type: Hamster/Gerbil Features: -Available in Chinchilla, Chinchilla Honey Sticks, Guinea Pig, Ham / Gerb Honey Stick and Hamster / Gerbil. -Available in 3 Pound, 25 Pound, 4 Ounce, 5 Pound, 10 Pound and 8 Ounce sizes. -Allergen information: manufactured in a facility that processes peanuts and other tree nuts. -Protection - rich in natural antioxidants for immune support and general health. Product Type: -Food. Small Animal Type: -Chinchilla/Guinea Pig/Hamster. Pet Category: -Small Animals. Color: -Blues & Purples. Generic Dimensions: -Chinchilla / 3 lbs Weight: 3.05 lbs. -Chinchilla / 3 lbs 9" H x 7" W x 4" D. -Chinchilla / 25 lbs Weight: 25.6 lbs. -Chinchilla / 25 lbs .5" H x 14.5" W x 25" D. Dimensions: Overall Height - Top to Bottom: -9 Inches. Overall Width - Side to Side: -8.75 Inches. Overall Depth - Front to Back: -4.75 Inches. 100502075 Size: 25 Pound, Pet Type: Hamster/Gerbil Features: -Availabe in Chinchilla, Chinchilla Honey Sticks, Guinea Pig, Ham / Gerb Honey Stick and Hamster / Gerbil. -Availabe in 3 Pound, 25 Pound, 4 Ounce, 5 Pound, 10 Pound and 8 Ounce sizes. -Allergen information: manufactured in a facility that processes peanuts and other tree nuts. -Protection - rich in natural antioxidants for immune support and general health. Product Type: -Food. Small Animal Type: -Chinchilla/Guinea Pig/Hamster. Pet Category: -Small Animals. Color: -Blues & Purples. Generic Dimensions: -Chinchilla / 3 lbs Weight: 3.05 lbs. -Chinchilla / 3 lbs 9" H x 7" W x 4" D. -Chinchilla / 25 lbs Weight: 25.6 lbs. -Chinchilla / 25 lbs .5" H x 14.5" W x 25" D. Dimensions: Overall Height - Top to Bottom: -9 Inches. Overall Width - Side to Side: -8.75 Inches. Overall Depth - Front to Back: -4.75 Inches. 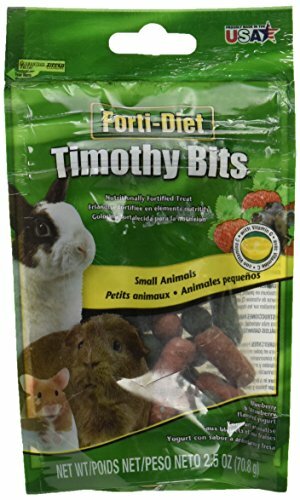 Forti-Diet, 2.This product is manufactured in china5 OZ, Blue Strawberry, Timothy Bits, For Rabbits, Guinea Pigs & Other Small Animals. This product is manufactured in china. For updated, accurate country of origin data, it is recommended that you rely on product packaging or manufacturer information. 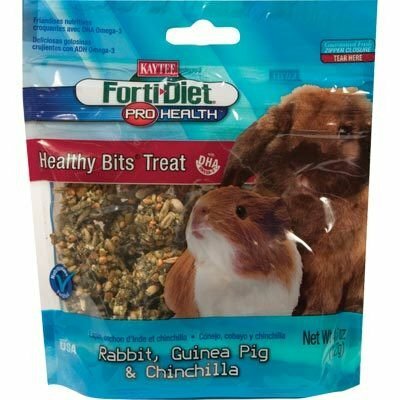 CENTRAL - KAYTEE PRODUCTS, INC HEALTHY BITS RABBIT/GUINEA PIG 4.5 OZ4.5 OZ Healthy Bits® are made with nuts, fruit, seeds and a touch of honey, all packed into a perfect size morsel to offer by hand or in a treat dish. 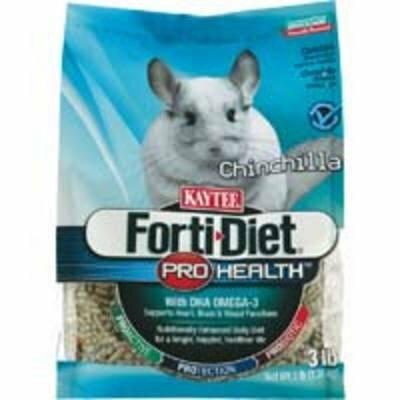 Kaytee Forti-Diet Dental Guinea Pig food is a pelleted mix that contains larger pieces to support dental health. These larger pieces provide your pet with something larger and more textured than the pellets to chew on. Small animals have teeth that grow continuously throughout their life. Their natural urge to gnaw and chew helps to mechanically wear down teeth supporting dental health. Forti-Diet Natural Timothy Hay. Supports the natural digestive process of rabbits, guinea pigs and chinchillas by providing required long strand fiber. Timothy Hay is a natural product with no additives or preservatives. Lower in calcium, Timothy Hay sustains the urinary tract function. The high fiber from Timothy Hay is conjunction with good feeding habits may support weight management. 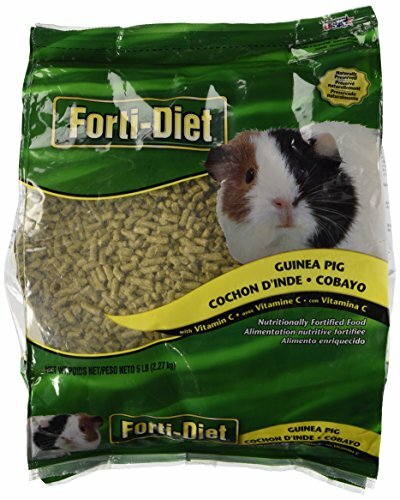 Kaytee Forti-Diet Pro Health Guinea Pig FoodKaytee Forti-Diet Pro Health Guinea Pig food was developed by an animal nutritional expert to ensure you pet gets the proper nutrition. Forti Diet Pro Health contains probiotics and prebiotics to support digestive health. This food is rich in natural antioxidants for general health and immune support plus contains some larger, more crunchy pieces to support dental health through natural chewing activity. Kaytee understands that sharing your life with a small pet is not only enjoyable but very enriching. Kaytee shows our love by ensuring we provide your small pet with the best nutrition for a long and healthy life. With over 150 years of nutritional experience, it's no wonder why Kaytee is at the heart of every healthy feeding routine.Ingredients: Sun-cured Alfalfa Meal, Ground Corn, Dehulled Soybean Meal, Ground Oats, Wheat Middlings, Ground Oat Hulls, Ground Flax Seed (source of Omega-3), Dicalcium Phosphate, Dried Cane Molasses, Ground Wheat, Salt, Soybean Oil, Ground Rice, Potassium Chloride, Magnesium Oxide, Calcium Carbonate, Coconut Oil, DL-Methionine, Fructooligosaccharide, Tetra Sodium Pyrophosphate, Sodium Bicarbonate, Titanium Dioxide (Color), Sodium Bentonite, Vitamin A Supplement, Choline Chloride, Yeast Extract, Mixed Tocopherols (a preservative), L-Ascorbyl-2-Polyphosphate (source of Vitamin C), Ferrous Sulfate, Yucca Schidigera Extract, L-Lysine, Riboflavin Supplement, Vitamin B12 Supplement, Vitamin E Supplement, Manganous Oxide, Zinc Oxide, Copper Sulfate, Niacin, Menadione Sodium Bisulfite Complex (source of Vitamin K activity), Rosemary Extract, Citric Acid, Calcium Pantothenate, Cholecalciferol (source of Vitamin D3), Pyridoxine Hydrochloride, Thiamine Mononitrate, Folic Acid, Calcium Iodate, Biotin, Cobalt Carbonate, Sodium Selenite, Dried Aspergillus oryzae Fermentation Extract, Dried Bacillus licheniformis Fermentation Product, Dried Bacillus subtilis Fermentation Product, FD&C Yellow #5, FD&C Blue #1, FD&C Red #40 Allergen information: Manufactured in a facility that processes peanuts and other tree nuts. Kaytee Forti-Diet Timothy Peanut Shaped Treats are 100% edible treat and chew combo. Made with Americaâs Favorite Timothy Hay and delicious vegetables your small animal will crave. Timothy Peanut Shaped Treats support dental health by encouraging chewing activity and will provide hours of enrichment. 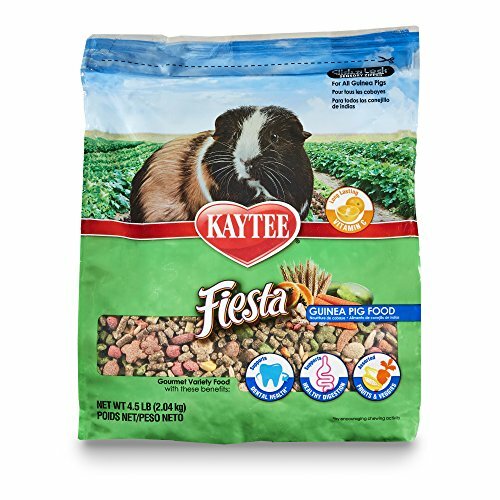 Kaytee Fiesta Guinea Pig food is a nutritionally fortified gourmet diet made of a premium blend of fruits, vegetables, seeds and grains offering maximum variety, fun and nutrition for small animals. Fiesta contains prebiotics and probiotics to support digestive health and is formulated with your small animal species in mind.Kaytee understands that sharing your life with a pet is not only enjoyable but very enriching. Kaytee shows our love by ensuring we provide your pet with the best nutrition for a long and healthy life. With over 150 years of nutritional experience, it's no wonder why Kaytee is at the heart of every healthy feeding routine. Kaytee Fiesta Banana Flavored Yogurt Dipped Rabbit, Guinea Pig & Chinchilla Treats, 3.5 oz. 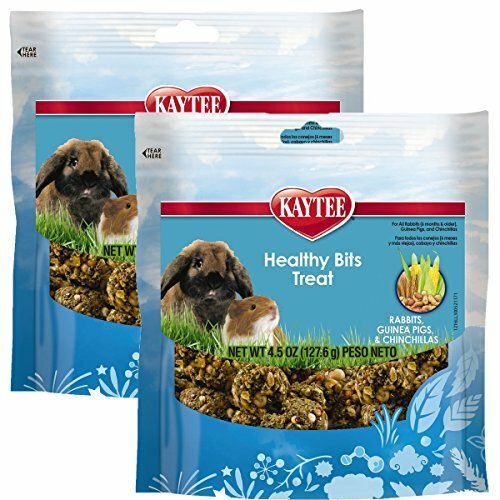 Kaytee Supreme Fortified Daily Diet Guinea Pig Food Kaytee Supreme Guinea Pig food is a wholesome, high-quality mix that contains all of the natural protein, fiber, oils and nutrients of whole grains. 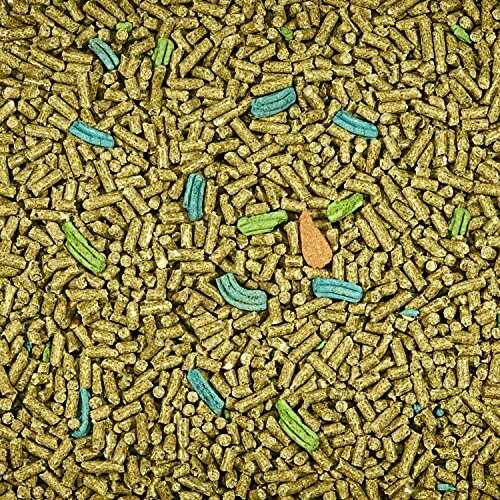 Fortified to ensure a balance blend, Supreme utilizes natural seeds, grains and pellets to provide your small pet with a simple yet healthy diet. Kaytee Supreme offers high quality ingredients small animals love and the nutrition they require. Kaytee understands that sharing your life with a small pet is not only enjoyable but very enriching. Kaytee shows our love by ensuring we provide your small pet with the best nutrition for a long and healthy life. With over 150 years of nutritional experience, it's no wonder why Kaytee is at the heart of every healthy feeding routine.Ingredients: Sun-cured Alfalfa Meal, Dehulled Soybean Meal, Ground Corn, Rolled Oat Groats, Rolled Barley, Wheat Middlings, Ground Oats, Ground Wheat, Cane Molasses, Dicalcium Phosphate, Soy Oil, Salt, Lignin Sulfonate, Calcium Carbonate, Potassium Chloride, Fish Meal, Brewers Dried Yeast, Iron Oxide, DL-Methionine, Ascorbic Acid, Vitamin A Supplement, Choline Chloride, Ferrous Sulfate, Riboflavin Supplement, Manganous Oxide, Zinc Oxide, Vitamin B12 Supplement, Vitamin E Supplement, Niacin, Menadione Sodium Bisulfite Complex (source of vitamin K activity), Copper Sulfate, Cholecalciferol (source of vitamin D3), Calcium Pantothenate, Pyridoxine Hydrochloride, Thiamine Mononitrate, Biotin, Folic Acid, Calcium Iodate, Cobalt Carbonate, Sodium Selenite. Treat your Guinea Pig to a crunchy, fun-to-eat treat and a touch of honey with Kaytee Forti-Diet Pro Health Honey Guinea Pig Treat Sticks. Treats are a great way to bond with your small pet, provide them with an enriching activity and satisfy their need to chew. 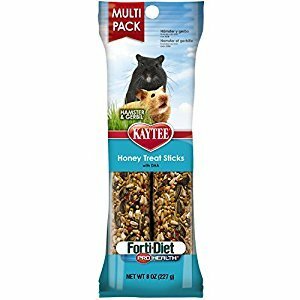 Kaytee Forti-Diet Pro Health Honey Guinea Pig Treat Sticks are honey sticks sprinkled with delicious, healthy ingredients like oats, corn, carrots, raisins, honey, toasted corn and wheat flakes and more. It contains DHA for heart, brain and visual health, sun-cured alfalfa meal, an excellent source of fiber, and natural prebiotics and probiotics for digestive health. Feed as an occasional treat or as a training reward. 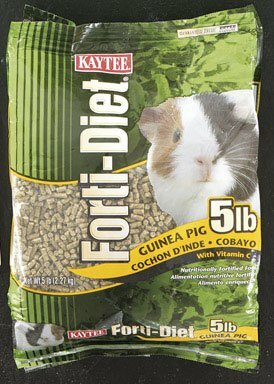 KAYTEE PET Forti-Diet Guinea Pig Food, 5-Lbs. 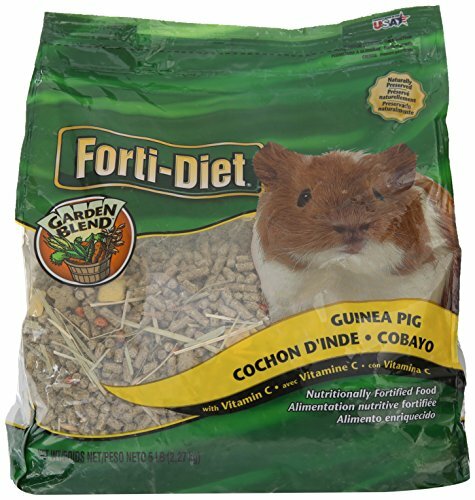 Looking for more Kaytee Forti Diet Guinea Pig similar ideas? Try to explore these searches: Thick Zinsco Breaker, Crystal Champagne Mini Chandelier, and Diameter Planter. BlesDeal.com is the smartest way for online shopping: compare prices of leading online stores for best Kaytee Forti Diet Guinea Pig gift ideas, Kaytee Forti Diet Guinea Pig deals, and popular accessories. Don't miss TOP deals updated daily.